A few years ago I had the pleasure to blog about the very talented Fae Simon, whose track ‘New Londinium’ featured on my video Let’s Jam. We caught up recently to discuss her music, her career to date and future projects we can all look forward to knowing more about. Q- Since your debut album ‘Melodrama’ you’ve been extremely busy touring and collaborating with various artist. What’s the theme and general inspiration for your second album? FS- My inspiration for Outrospective was my observations of all the people I encountered while on tour with Yarah Bravo & Jehst. I saw first hand the true power of music in action; as it didn’t matter wherever we went and performed the love of music unified us all. It is also a critique of my environment, as I believe it is the responsibility of all good creatives to do so, and to try and affect change though our art. For example, ‘Running’ is dedicated to Mark Duggan and the residents of Tottenham, following his death and the subsequent riots. I was actually stuck in the studio for 5 days unable to get home, as they’d blocked off the whole of Tottenham High Road, so it allowed me to reflect on the situation and write the song for the album. Q- Has this album been easier to produce? FS- No, not at all. Besides personal issues I had during the creation of the album, I had some unforeseeable and predictable obstacles to hurdle to complete it. It was more stressful trying to get the administration of the initial collaborations finalised than actually writing and creating the music. I had to re-record some tracks with the band but they were the most fun to do and nothing can touch the sound and feeling of live music, so it worked out as it was supposed to. Q- You’re a multi-disciplined artist. Apart from promoting the new album, what else does the immediate future hold for you? FS- my new single ‘The One That Got Away’ is due for release in April, produced by CloudFistConceptz, with remixes by DJ Raw Sugar, Shaun Ashby & Beyond Tone. The video is due for release in 2wks, directed by Chiba Visuals. I am making my acting debut on March 19th at the University of West London for national storytelling week, in a production called ‘Soweto Voices’. It’s raising awareness of Apartheid and celebrating South African culture. The cast are all 25 and under, so I’m the only artist/tutor who also gets to perform, so I’m extremely excited, having studied drama from GCSE to degree, and this being my first professional drama production. I am also raising my fine art profile this year. I have been commissioned for murals and exhibited in London, New York and Berlin, so I know I have a market, I just need to build my portfolio this year. I have been offered an exhibition in Copenhagen with a certain amazing fine artist called David Emmanuel, so I should be ready to take on the art world by then. Q- Yes, the Scandinavian connection is still in the making! lol You’ve spent time in Germany, amongst other places recently. In light of the very public discussion over a lack of diversity in the arts, do you have any particular views or experiences that support a call for a greater degree of representation? FS – I think all people who are of an ethnic background who live and work in the West feel underrepresented. Of course that is something that needs to be addressed, as only last week, for the first time in a long time, there was a black family in anadvert (I believe it’s the new Samsung ad) and other black people noticed enough for them to comment. It’s a sad state of affairs when that is a noticeably surprising occurrence on television in the 21st century, so how can we be too surprised when no black actors or directors are nominated for Oscars? I think it was last year or the year before there was public outrage when Viola Davis was called “not classically beautiful”, as opposed to Kerry Washington. Both beautiful black protagonists in major US dramas, but I guess Viola’s features were considered too classically African to be classically beautiful? As someone who studied dance and drama to degree level, I was very much used to being the token representative for my whole race in a lot of circumstances; or the class or project would reflect the country on a microcosmic ethnic level. It amused me, as stereotypically black people are artistically creative, yet I would always be 1 of 1 or 1 of 3 – from the age of 8-21. Since I was a child representation has meagrely improved, or is still prejudiced to the point of subliminal, (i.e. Zayn Malik’s Pillowtalk video) so we can only continue to take a stand, make some noise and continually voice the injustice or our silence will be misconstrued as acceptance. Fae Simon: An Artist Going Onwards and Upwards! As you should be aware, I take pleasure in reporting the professional advance of fellow artists. I find it motivational and hugely encouraging to observe the ambition, tenacity and will of individuals pursuing their interests, developing their careers and moving closer to fulfilling their dreams. I take particular pleasure in witnessing the progress of my cousin Fae Simon as she moves forward, establishing her credentials as a singer-songwriter and painter. 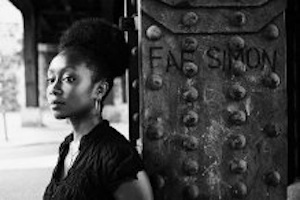 Gaining further performance experience from supporting N’Dambi at London’s Jazz Café and touring with Yarah Bravo & Trommel Tobi on her ‘Good Girls Rarely Make History’ tour, Fae has introduced Europe to a new facet of her style. 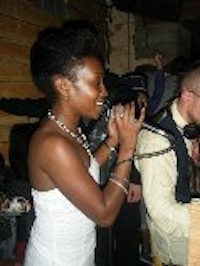 After headlining ‘Got Soul’ at the Bohannon Jazz Club Berlin in November 2010, the next year brought two fresh releases. The first was ‘RoyalFlushLushSelf’ taken from the ‘Faerie in the Cloudz’ EP, an experimental collaborative EP reflecting a journey of the alter egos of Jonas McCloud aka CloudFistConceptz; and Fae Simon aka the AfroFaerie, available for download on the ‘Untold Songs’ compilation for Amnesty International. The second was ‘I See You’ a reggae/dub hit on the ‘Love The Music’ compilation released by Ryff Music in conjunction with the Caribbean Tourist Organization, featuring Singing Melody and Aloe Blacc. I take pleasure sharing a recent conversation with I had with her. DEN: You’re a talented painter as well as a singer- songwriter so are you furthering your visual art career? FAE: I have just successfully exhibited & sold my first pop art piece in Berlin, for the annual artshow and am working on 3 canvases for exhibiting at Yarah Bravo’s ‘Pop-Up’ store, which should be back in Brick Lane next month. DEN: Since I can remember you’ve been singing but how did you get into it? DEN: Who is your greatest inspiration within the industry? FAE: That is a BIG question because I don’t really know! I’d say Lauryn Hill, because she can sing, act & is one of the best female rappers ever! She was iconic as a young dark-skinned, natural-haired woman in a crew with men. She showed me that I could do it all & do it well when I was young. Aim high!! DEN: Of your contemporaries, who would you like to work with and why? FAE: Ooooh, the hard questions keep coming! DEN: Ok, I’ll let you think on that one. I loved the energy and eclectic sounds of your last album. What should we expect of your second? FAE: Even more! I have more collaborations with featured artists, not just producers; such as John Robinson & Pugs Atomz, as well as some fully live tracks. You will even hear me rapping on it too! I’m really excited about it! DEN: Many UK RnB female singers have their sights set on the US and overseas. I know you’ve toured Europe in recent years so what’s next on your agenda? FAE: I’m not an RnB singer, but yes I hope to get out to the US asap! I wish her the best of luck with her career. For further information on Fae Simon please visit.